This original recipe was two years in the making. I spoke before about process, brainstorming and sensations inspiring creativity, whether roaming about the farmers markets or insomniac 2am late nights. 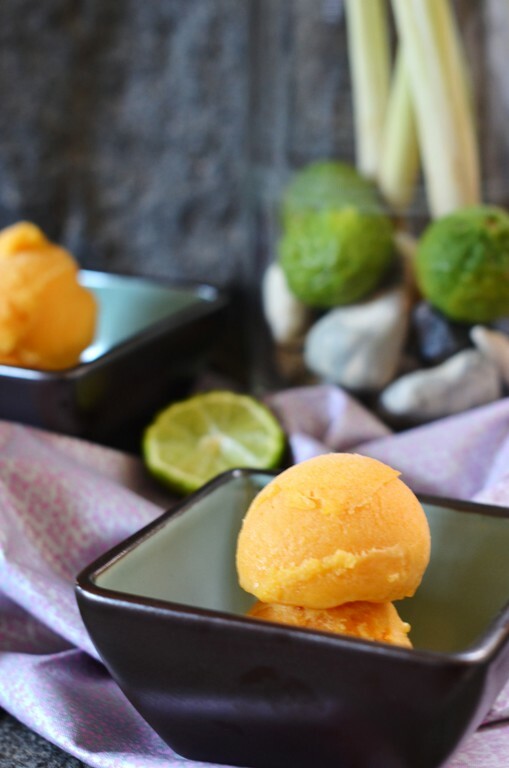 I spoke of process in my Lemondrop Melon Limonana Sorbet post which I feel draws many parallels to this one, beyond the mere fact that both are sorbets. Those of you who know me for a couple of years might remember this persimmon photo below taken on December 4, 2009 with my point and shoot camera. Those of you who are new to me, you get a glimpse of it as it is part of my site's header. At the time, winter of 2009, my intention was to make persimmon creme brulee as I love anything custard. With Meyer Lemon and Orange confetti and cardamon speckled creme brulees published approximately around the same time, I felt it redundant and predictable to publish a persimmon one. Two winters have gone by. Meanwhile my son, who was a high schooler at the time, is now a college student We, empty nesters. Recently we've had Jonathan's dad in DC for a conference, so we met up with him a couple of times for dinners out, but it opened the floodgates and we found ourselves for a stretch of a couple of weeks exploring different restaurants about town. Then we tire, and want to retreat to our cocoon yet again till the next time. On our whirlwind exploring restaurants in DC we found ourselves ordering sorbet samplers to share as desserts. The Yuzu, strawberry with black pepper, exotic and myriad of other flavors inspired me further to arrive at this seasonal persimmon and Kaffir lime combination. If Meyer lemons were all the rage the last couple of years, I am starting a new Kaffir limes trend. 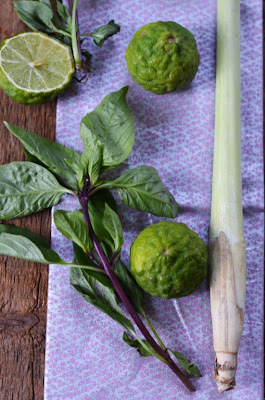 Many are familiar with Kaffir lime leaves in Southeast Asian cooking but not as familiar with the wrinkly, aromatic lime itself indigenous to the same region. The fruit is referred to in Indonesia as a medicine citrus. Rind and juice are used for medicinal purposes but the rind is mostly used in cooking. The juice is considered too acidic for cooking, though I find it more fruity in fragrance and taste while I find regular limes to be more acidic. Maybe the pairing of the sweet persimmon struck the right balance?! It is also used for washing hair and clothing in Thailand. Kaffir limes can be found in Asian markets and this time I was giddy with excitement when I spotted them at Whole Foods. They were California grown. The Japanese persimmon, native to China, is the most cultivated variety in the world. The variety was later cultivated in other places in Asia and then made its way to California and southern Europe in the 1800s and to Brazil in 1890. The Japanese variety Hachiya is best consumed ripe as it is high in tannins and astringent when unripe. The Israeli bred Sharon fruit is ripened on the trees, is seedless and sweet, and is believed to help in avoiding heart attacks brought on by the thickening of the arteries' walls. The Date Plum, native to Southwest Asia and Southeast Europe, was known by the Greeks as 'the fruit of the gods', 'nature's candy' and 'fire of Zeus'. The American persimmon, native to eastern US, is higher in vitamins and calcium as opposed to the Japanese persimmon. The Mexican variety, the black persimmon, with green skin and white flesh turns black when ripe. The Filipino variety, which is also native to China, is known as the velvet apple, Mabolo or Shizi (in China) or Korean apple. The Fuyu is another variety known in the US which falls under the non astringent category. 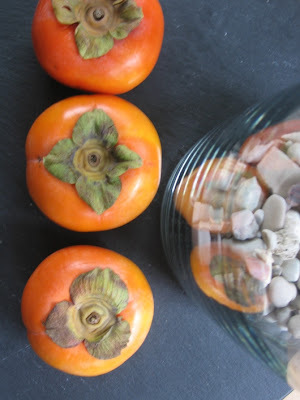 Place persimmons in a Ziploc bag and freeze over night. Next morning take out of freezer and let thaw. Remove leaves. Liquify in a blender, add the Kaffir lime juice and run through a strainer. In a small sauce pan add the strained persimmons and 1/2 cup sugar. On low/medium heat, mix until the sugar dissolves. Remove from heat and let cool. Add the lemongrass and purple/Thai basil leaves and let steep refrigerated overnight. Next morning discard the lemongrass and basil leaves and churn according to manufacturer's directions for about 20 minutes and freeze for at least a few hours before serving. *Disclaimer: Research and information for this post was done online. Consuming large quantities or unripened persimmons can cause some medical issues. If you have medical questions you should consult a professional in the medical field. What a gorgeous combination of flavors Shulie! I love the purple and orange in the photos! So gorgeous and this looks like such a refreshing treat. I never know what to do with persimmons... Stumbling this! Thank you for writing this post, Shulie! You talk about plants and you know I am all ears! We get to have our sorbet and learn interesting tidbits. There are other fruit trees in the Philippines related to the persimmon; however, there is also a tree, INDIGENOUS to the Philippines that bears the MABOLO fruit. It is the KAMAGONG tree, an endangered tree species and protected by Philippine law. I love the mabolo fruit. I could not think of another fruit to compare its fragrance. The texture of the "meat" does not resemble persimmon. Not as smooth as banana, though not grainy like pear. [To me] the flavors of kaffir, lemongrass, and basil are redolent of Southeast Asia during monsoon months. Thanks for the virtual tour via a serving of sorbet ;-). 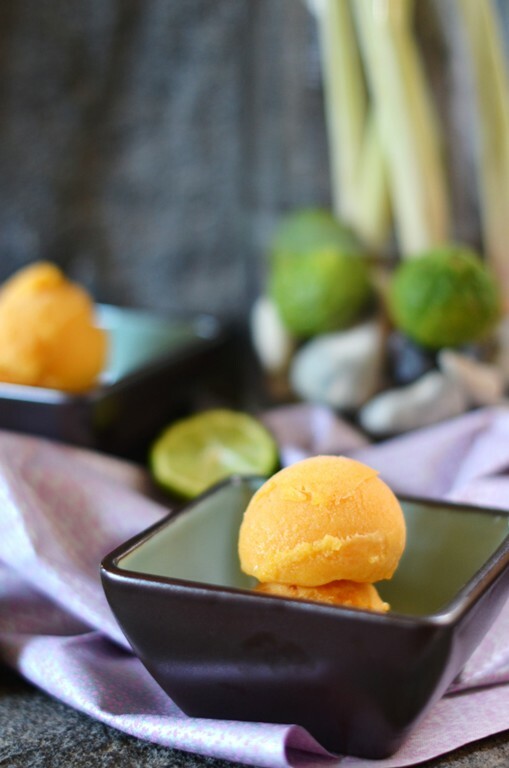 Wow, Shulie this sorbet is just gorgeous, such a wonderful flavor combination! I have never used kaffir limes, only the leaves! So great that you found them at whole foods! There are plenty of persimmon around though. I can imagine the taste of this, and I am sure that it is delicious. That is a an exquisite and fabulously exotic sorbet flavor! Absolutely fabulous, Shulie. Like I said on FB, my tongue starting tingling immediately upon reading the title! It awoke all my senses. Such a beautiful and inventive array of colours and flavours. TY Nelly, Marina, you gals a super sweet. Yeah was not sure how the purple & orange would work together but was determined to use that fabric now for awhile. Also picks up the hue from basil. :)Yuri, me too. We eat it raw, so it had to be a recipe that is not far, not to much cooking involved for me to be agreeable with another form if consumption of persimmons:). BTW Jonathan loves them too! Thx Annapet, so nice to get info since you have first hand knowledge. Love the enhancement of my post with your anecdotes. I also read that there are varieties that are not suitable for human consumption. I was surprised to learn that the Kamagong is an endangered tree species. TY both you and Yuri you gals rock! I know Katherine, aren't they delicious in Israel?! Lucky girl! :) The flavors really complement each other with a delicate balance.TY Rosa you always find the right words to make me smile. Thx Aimee, I will hop over to FB. :)You are the sweetest. Tingling tongue made me giggle. What a fantastic combination of many of my favorite flavors! I am excited to be in the middle of persimmon season right now, and always ready for a trip to SE Asia, imaginary or real, so this really intrigues me. This is very creative - I would have never thought to combine all those flavors into one dish. Shulie - this not only sounds amazing but the color is gorgeous!! Truly unique! What a wonderful combination of flavors! I would love for you to share this with the Gallery of Favorites (It is a hop April and I host over the weekend) as this is sure to become a favorite at my house! Your recipes just keep getting better, Shulie! Oh, I love it! You are my kind of blogger. Bookmarked for sure. Oh my gosh! This looks so good. Gorgeous sorbet and i love the flavor combinations. Back to comment again! 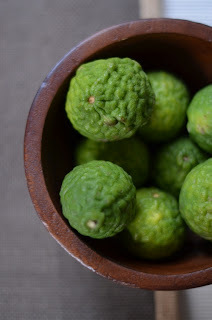 I didn't realize until another one of your readers commented that Kaffir lime is the same thing as combava, which is used in Réunion and other islands in the Indian Ocean in cooking and to make a fantastic limeade. Fabulous! Wow! And such unusual, uncommon flavors but how they must work so beautifully together. Beautiful sorbet... and thanks for introducing me to these fruits (I see them at the market but never stop to ask about them). What truly exotic flavors you've combined to make this uniquely delicious sorbet, Shulie. I can imagine how wonderfully refreshing it tastes. 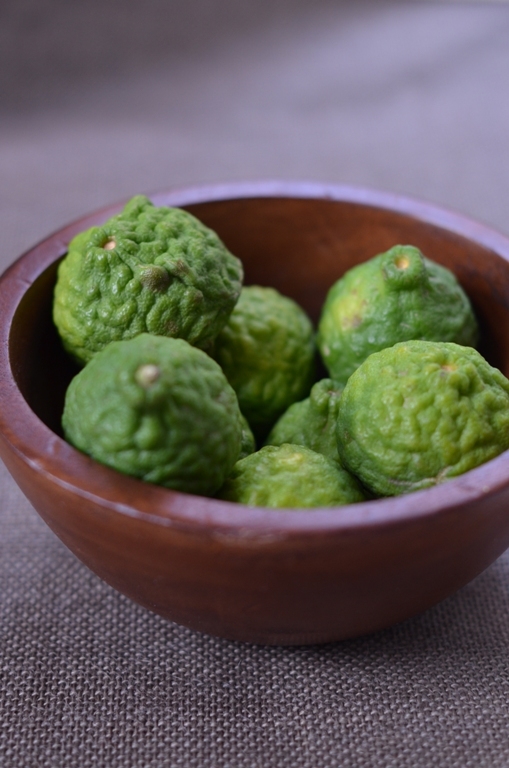 Here is the information that you requested about kaffir lime on my blog. This one is a sure out of the box recipe and looks fun and intriguing aside from good tasting. Very fancy and delicious looking! Very creative Shullie! I love this combo! 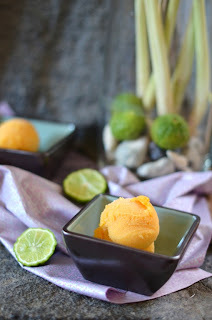 I love your persimmon photo Shulie, and this sorbet will all the lovely flavors looks fabulous! If you like persimmons, I have a recipe for gluten-free persimmon pudding on my blog. My great aunt used to make it and it was always my favorite dessert at Thanksgiving (with lots of whipped cream :-) Hope you had a wonderful Thanksgiving!